In yesterday's post about charting limited palettes, I mentioned that the colors you choose for your palette don’t have to be blue, red, and yellow. 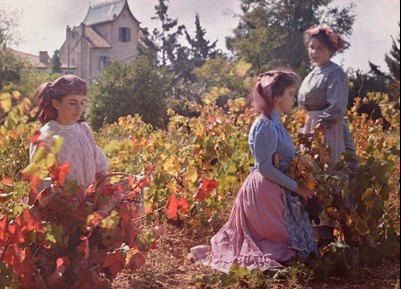 Autochrome by Louis Lumière"Madeleine, Suzanne et Andrée à travers les vignes"
You can use what we think of as "secondaries,"—orange, green, and violet—as primaries and come up with very interesting color schemes. 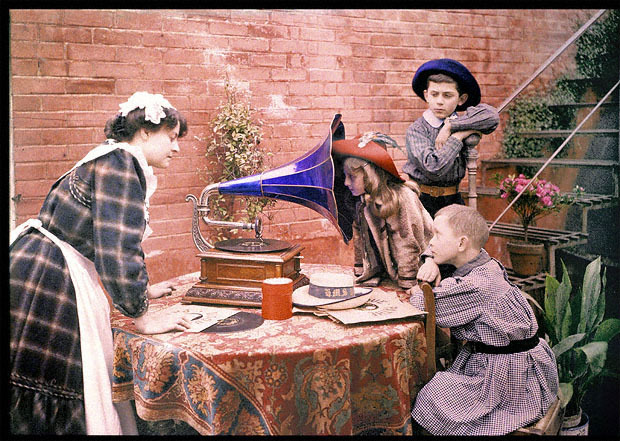 The Autochrome process, an early form of color photography, did just that. Autochromes used grains of potato starch dyed red-orange, green, and blue-violet. Through a magnifier (below), the individual colored grains are visible (left courtesy PhotographyMuseum.com, right courtesy Univ Delaware). I'm not sure how accurate the color in these examples are. The first one looks Photoshopped to pump the colors, and the second one looks yellowed. But you get the idea. Yellows are mixed from orange and green, similar to the way they're mixed from red and green in computer screens and theater lights. 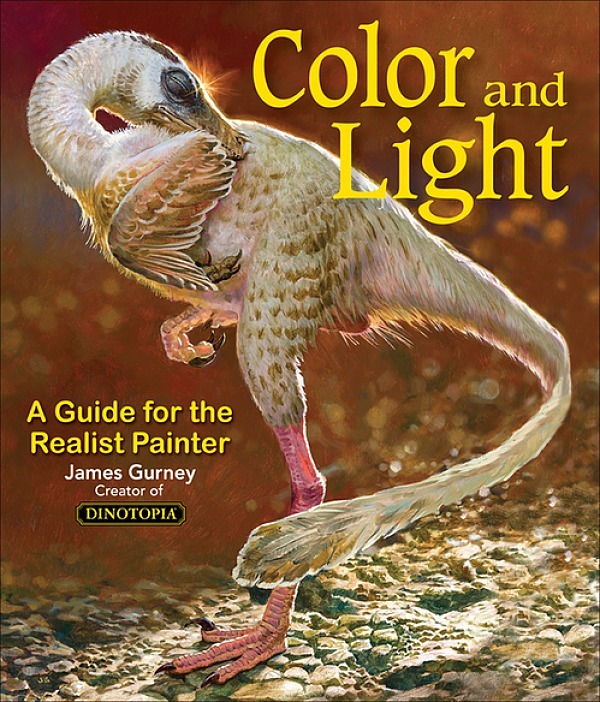 Yellows are the hard color to achieve this way, because they come out weak and low value, so they have to be tinted up with white, and at best they'll be sort of beige. But the experience of building a color scheme where the colors we think of as "primaries" have to be mixed from "secondaries" is a strange exercise that will rewire your color brain. If you only use green, orange, and purple on your palette, you wouldn't be able to mix high chroma reds, yellows, and blues though would you? Robert, true, in the same way you can't mix high chroma oranges, greens, and violets from red yellow and blue. I use liquitex acrylic paint and they sell what are called Primary red, yellow, and blue and they seem to mix pretty high chroma secondaries. Also cyan, magenta, and yellow seem to mix pretty high chroma secondaries. Do the premixed greens,oranges, and purples that paint companies sell have even higher chromas then the secondaries mixed from paints labeled primary red, blue, yellow and a palette of cyan, magenta, and yellow? They aren't pre-mixed. They are discrete chemical compounds, such as dioxizane purple, pthalo green, and pyrolle orange. 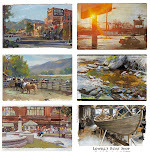 Robert, the basic principle is that any mixture made from any two hues will result in a secondary hue of lesser chroma than the original hues, just as a straight line between any two points on the outer edge of the color wheel. The closer the two starting hues, the higher chroma the mixture. As Stephen said, a given paint color will often be either a single pigment or a composite of multiple pigments to achieve a certain hue. David, thanks for that additional information. Of course we're not speaking of such experiments with the objective of achieving the largest gamut, but rather achieving gamuts that have unconventional harmonies. If the only goal were to achieve the largest possible gamut from three initial subtractive primaries, then people would probably use something resembling cyan, magenta, and yellow. But from a painter's point of view, large gamuts are not necessarily desirable. Undoubtedly! My comment was just to clarify the answer to Robert's question at the top.